Just came back from a month in the shithole that is South Korea. 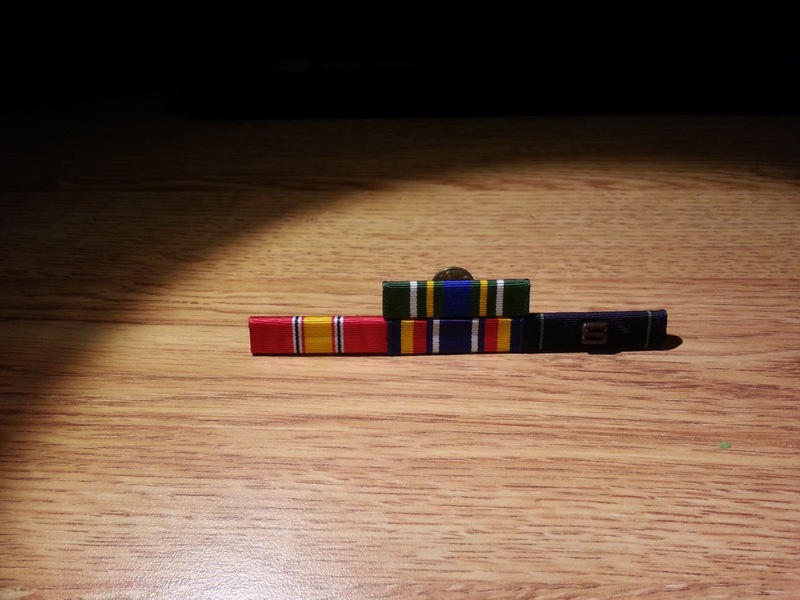 After five years of reserve and active time I finally got my first set of ribbons outside of bootcamp - The Korea Service ribbon, a good conduct ribbon (not shown), and a global war on terrorism ribbon. The first for just being in Korea for more than 30 days, the second for being in four years, and the third for being at a duty station for more than 60 days. Sure, they're basically handed out for free for literally doing nothing, but at least now I don't look like a total n00b. And I'm still an E3/Seaman after all this time. That's partly my fault for not studying harder. I never realized that the reserve advancement exam is a cakewalk compared to the active exam but now I know to study harder. I was 5 points away from passing and I really could have used that extra cash to buy all kinds of stuff. Oh well, there's always November. They gave me until 2016 to reach third Class or I get the boot, which seems like an unnecessary generous amount of time.